With the hustle and bustle of daily life, the standard way of eating has also evolved dramatically. Restaurants and fast food chains have picked up from this and has adapted a new way of serving food for people on the go. Thus the to go method of eating and packaging was born. However, for any business to succeed in this industry, simple word of mouth would not cut it. To back this up, a good restaurant business should always be prepared with elegant and appealing visual materials to present to their hungry customers. For restaurant owners and managers wanting to not only save money but also to get high quality prints can rely on UPrinting. Only UPrinting delivers fast printed menus for to go services. Unlike other online printers, UPrinting gives clients the option to select anywhere from 2 to 6 working days for the delivery of these to go menu prints. 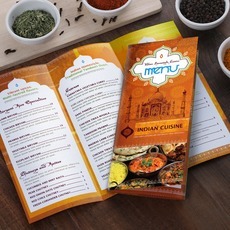 UPrinting also gives consumers more choices for their to go menu prints. Orders can be produced in either 8.5 x 11” or 11 x 17” sizes as well as the option for the free menu scores. Clients can also choose between a 100 lb. text gloss paper or a 10 pt. cover gloss material as the main material for their restaurant menu. All in all, UPrinting’s to-go and take-out menu prints are the perfect menus for businesses that cater to life on the fast line.